This Smithfield Sunflower Engagement Session is one of my favorites! We met Emily & Tyler at a bridal show last year and they won a free engagement session from us! Emily wanted their photos taken in a sunflower field. So last summer, we hunted around for one and found a small one in Chesapeake and we had a great time. In August, word got out that Windsor Castle Park (which is right down the road from them), planted a giant field of sunflowers! So we went out into this sunflower heaven for a few more photos of them! It was so gorgeous, I’ve never seen such a large field of sunflowers before! Emily & Tyler are such a great match for one another. They compliment each other so well! They are so easy to photograph, too. 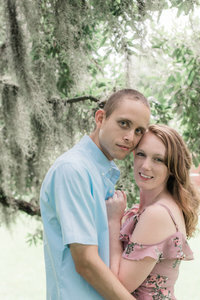 They will be getting married this Saturday at Harley’s Haven, we cannot wait! Her bouquet will be full of sunflowers of course!